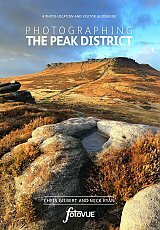 If you are a keen photographer who can't miss a sunrise or are on holiday using a mobile phone camera, this guidebook will take you to the most beautiful and photogenic places in the Peak District. If you are a keen photographer who can't miss a sunrise or are on holiday using a mobile phone camera, this guidebook will take you to the most beautiful and photogenic places in the Peak District. PHOTOGRAPHING THE PEAK DISTRICT is a photography-location and visitor guidebook. The Peak District is a beautiful upland area at the southern end of the Pennines stretching from Ashbourne in the south to the M62 in the north. The northern Dark Peak is an area of wild heather-clad moorland lined by gritstone edges and boulders that contrast with the limestone plateau and deep dales of the White Peak. Cut by sparkling rivers, populated with beautiful villages, a rich industrial heritage and home to Chatsworth House and Haddon Hall, the UK's first national park has photographic opportunities around every corner, all year round. FEATURING: - 150 locations including all the classics - 750 photographs - Detailed maps, directions and co-ordinates for each location - Best seasons and time of day to visit - Sun compass - Accommodation and best pubs - Roadside and short walk locations - Longer photographic walks - Accessibility information Ladybower & the Derwent Reservoirs, Bamford Weir, Stanage Edge, Hathersage, Surprise View & Padley Gorge, Froggatt Edge & the Eastern Edges, Dove Stones Chatsworth House & Haddon Hall, Tideswell & Litton, Peter's Stone & Cressbrook Dale, Monsal Dale & Ashford-in-the-Water, Bakewell, Hartington, Lathkill Dale Dove Dale, Vale of Edale, Winnats Pass, Mam Tor, Cave Dale and Peveril Castle Kinder Downfall, Three Shire Heads, Lud's Church, Parkhouse and Chrome Hills, The Roaches, High Tor & Matlock Bath, Peak Rail, Black Rocks of Cromford, Derwent Valley Mills - A Heritage Tour, Well Dressing & Agricultural Shows Listings.